Any of you on a diet? Trying to lose weight? Or maybe you just want to watch your food intake and just eat healthy. If you're anything like me and eat a lot, as in snack a lot and quite frequently, you really want to be careful about what foods are going into your body. Nowadays health issues are increasing, due to the lifestyle and food around us, so why not attempt to be a bit more cautious. I used to eat a lot of junk, and I started feeling really tired and sluggish until I came across Graze. Graze sell healthy snacks according to your likes, such as chocolates, popcorn, dips and dippers etc. Yes I said healthy!! Just to add this review is NOT sponsored, and solely my opinion..
Now to be completely honest, the sound of HEALTHY normally does put me off, and must put some of you off too, but seriously these snacks are DELISH! They're actually surprisingly tasty. 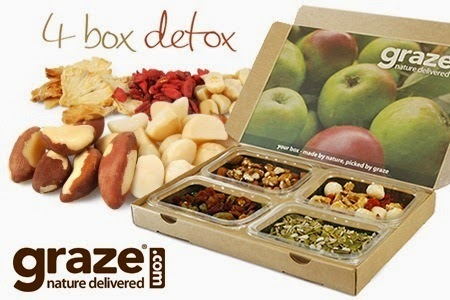 Graze send you SURPRISE boxes which is exciting but also can be a downside as you may come across snacks you don't like, but it's okay as after every box you receive head over to Graze.com and rate the foods. You can bin the ones you never want to receive. I personally rated ALL the snacks before placing my order. I 'bined' all the foods I couldn't eat such as any containing meat, or things I just don't like. I left the rest of the foods on the 'try' option and pressed on 'like' to the ones that sounded good. Now after receiving a few boxes I have changed the like to love, and also ticked the 'Send soon' option so Graze might send them to me. You can choose as often as you'd like to receive them as well! But make sure you DO choose how often you want the boxes, otherwise they will be sent out to you every 2 weeks and you will be charged, so just snooze the boxes. Now because I love mine so much, I'm going to share my code with you all, which allows you to get your first box FREE. Not just the first, but also the 5th and 10th too. Hope you all enjoy. Don't forget to let me know how you like them..